A new, fragrant beauty arrives on the market in February 2009 and joins perfume collection by Elizabeth Arden. It was named Pretty and it will be available in as many as 27 countries of the world. Pretty seduces with its feminine concept, which rounds complete body and face care, as well as with floral juices created by perfumer Claude Dir of Givaudan. The fragrance opens with refreshing breezes of Italian mandarin and orange blossom mixed with peach juices. A heart is floral and gentle, created of petalia, starry jasmine, pink lily and peony, while base is soft and pleasant, composed of musk, Jacaranda wood and creamy amber. Petalia is a new, floral molecule which was first used and introduced in this very perfume. It is a creation and patent by the house of Givaudan. A flacon of Pretty is feminine, transparent and made of glass, with a heavy glass bottom. It was inspired by flower vase, since floral theme marks this edition in every view, from advertisement to ingredients. The advertising campaign was made by creative director and vice-president of the house of Elizabeth Arden, Mark Dixon, and it was envisaged as a timeless floral saga decorated with floral motives captures in a fragrant and feminine moment. Advertising video and posters were made in a team, by husband and wife - Coliena Rentmeester and Tom Dey. TV commercial will be shown starting from January 2009, whereas advertising materials and posters will be present in fashion catalogues from March 2009. 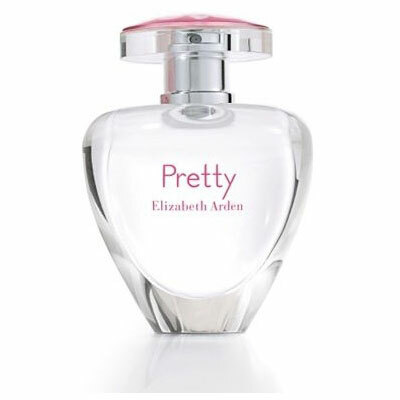 New fragrant beauty of the collection Elizabeth Arden - Pretty, will be available as 50ml (1.7oz) and 100ml (3.3oz) Eau de Parfum, 200ml (6.8oz) body lotion and 100ml (3.4oz) body powder.